A Midnight Rider: Crazy Heart. Sunday afternoon is movie day at this house. Yesterday we showed the movie Crazy Heart. I am not a country music fan, so this was a long afternoon. 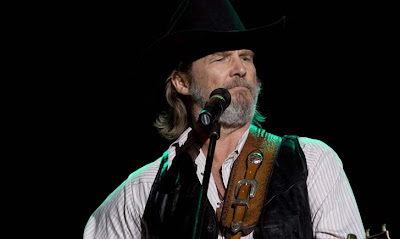 Jeff Bridges, as usual, did a great job getting into character. I once mentioned that people like Jeff Bridges, Brad Pit, Ed Norton and a few others, become the character they play, while others like Tom Cruise, Denzel Washington and Will Smith always are Cruise, Washington and Smith. A wise sage simplified it for me by saying, the first three are actors, the second three are movie stars. Back to Crazy Heart. If your a country fan, you may like this. If you are like me and do not like three cord country music, skip it. The storm yesterday not only brought rain, but mild temperatures. There were some lingering mist for the morning commute, but the 55 degrees more than compensated. The first stop was Red Box. All lit up naturally. I didn’t know I liked country until I saw this movie. But I knew I liked Jeff and knew I loved Maggie. This is now my favorite movie. Ed Norton is my favorite actor, hands down. I saw a couple of days ago his indie film 'leaves of grass' where he plays two characters and it was very good.